You may show your BipolarAwareness and Support by purchasing both pins and wristbands. The pins were designed by Joyce Sang whose son, Ryan lost his battle to Bipolar Disorder. 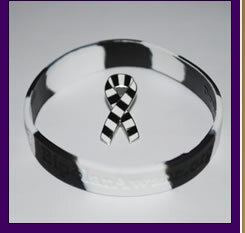 The black and white striped ribbon signifies the manic and depressive side to the illness. Please visit their site to help find an empirical test for the illness www.ryanlichtsangbipolarfoundation.org. The wristband design follows the black and white theme of the pin. The band is inscribed with the BipolarAware.org themed butterfly logo and followed by “Carol Anne’s Mission”. Both the pin and wristband will prompt curious inquiries because of their unique design. Let people know you are BipolarAware.